Deer dance in a circle around a blazing peyote bud. Brother of the Huichol people, Kawuyomaire is a blue deer who travels the heavens as a guide and guardian. He can be heard by the shaman, or mara'akame, and his presence is perceptible through the peyote flowers that blossom into psychedelic brilliance. 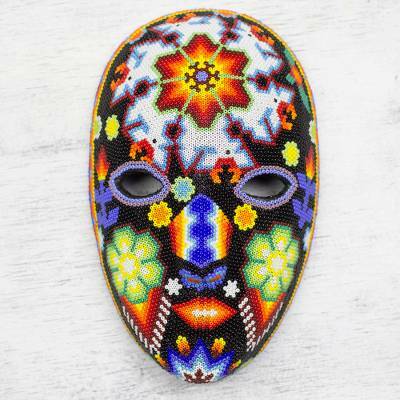 Higinio Hernández crafts this stunning mask, creating the images with tiny beads. Corn plants grow on the temples, peyote blossoms cover each cheek and a star graces the chin.